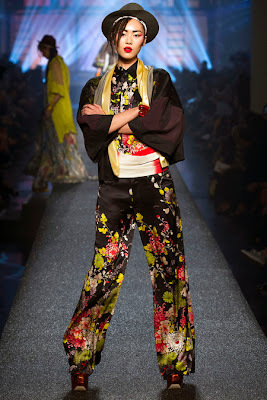 Following a month long frenzy of mostly unimaginative fashion spectacles, leave it to the original "enfant terrible of fashion" Jean Paul Gaultier to provide some much needed fashion relief with a tongue-in-cheek tribute to Eighties pop icons for his Spring/Summer 2013 presentation. Top models Joan Smalls, Karlie Kloss, Liu Wen, Constance Jablonski, Jourdan Dunn, Sigrid Agren, Hannelore Knuts and Sessilee Lopez channelled Boy George, Sade, Annie Lennox, Grace Jones, Madonna, and Abba amongst others in a countdown of Eighties pop legends. The cast assembled proved to be one of the most ethnically diverse of the Spring/Summer 2013 season with coloured models Kelly Gale, Lais Ribeiro, Ajak Deng, Betty Adewole, Anais Mali, Yasmin Warsame and Shena Moulton taking centre stage. One of my most prized designer pieces is a long sleeved Gaultier mesh top with velvet tattoo motif swirls which I purchased almost twenty years ago at Barneys. 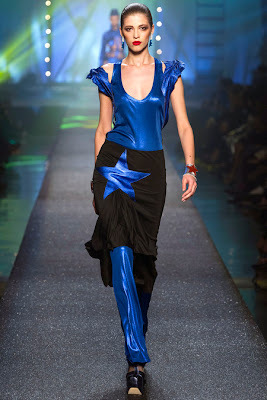 Gaultier's pop infused collection was an important reminder of the key elements which sparked my initial interest in fashion, that is the pure magic of fantasy with a dash of good old fashioned fun. looking adorable fashion stills... thanks for sharing.